Hope everyone had a good Father's Day. Our daughter came down and we went for a boat ride and snorkeling. It's too hot out to do anything that doesn't include water! This is the Father's Day card I made for my honey. I used the same technique I've been stuck on. I've been calling it a collage background, but someone said that it was a faux batik, and I think I like that name better. 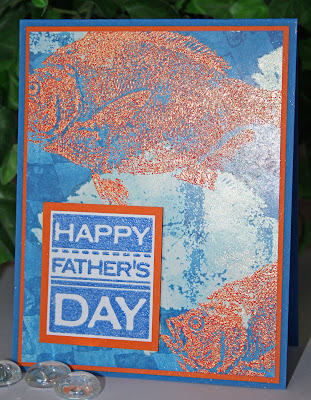 I used the glossy cardstock and clear embossed the fish on it. Brayered on Pacific Point, then ironed off the embossing powder. I used the Print Pattern background stamp from SU and stamped it randomly on with Pacific Point and it still resists from the fish print some if you wipe it with a paper towel. Then I embossed again, but this time with Orange Marmalade from Sparkle n Sprinkle. The Happy Fathers Day is a SU stamp from All Holidays, and is embossed with Rhapsody from SNS. What a fabulous FD card for a guy who likes to fish!